Advocates for equitable hiring practices in Canadian higher education are commending the prestigious Canada Research Chairs program for introducing new guidelines that aim to curb bias against women in the program’s nomination process. Recently, the CRC added guidelines on how to limit unconscious bias in its package on reference-letter writing. Michèle Boutin, executive director of the CRC secretariat, said the new section was inspired by a pair of studies (one by the American Association of University Women in 2010, the other by Frances Trix and Carolyn Psenka of Wayne State University in 2003) that show letters of recommendation for female candidates tend to be shorter or incomplete; include gendered terms such as “lady,” “mother,” or “wife”; use fewer “standout” adjectives like “excellent” or “outstanding”; focus on personal qualities over skills and achievements; and offer more “doubt raisers” such as faint praise or negative language. These biases tend to appear in letters of recommendation regardless of the referee’s gender. “Because of the importance of reference letters in the CRC nomination process [nominees require three letters of support], it was important to bring this to the attention of letter writers,” Ms. Boutin said. Though she has generally noticed the addition of guidelines for how referees and review panels should consider extended interruptions in a candidate’s career for childbirth, illness, caretaking or other reasons, this is the first time Dr. Dodd has seen guidelines on unconscious bias explicitly stated from a granting, research or postsecondary institution. Guidelines addressing unconscious bias are just one step in a larger set of initiatives the CRC has introduced in an effort to improve diversity among chairholders, particularly among groups of people identified as historically underrepresented in government programs: women, Aboriginal people, people with disabilities and people belonging to a visible minority. About four years ago the CRC began working with individual universities to set targets to improve representation of designated marginalized groups among their chairholders. These targets are reviewed and revised every three years. Additionally, the CRC introduced random monitoring of the nomination process, which looks at how the position was advertised and how the process was handled internally, among other details. An annual recognition program then spotlights one university’s exemplary practices in recruiting a diverse talent pool. The selected institution is given a platform for discussing what it has done to improve access to its chair positions as well as the barriers they’ve encountered along the way. In previous years the program has singled out the University of British Columbia and University of Victoria and this year recognized Lakehead University. On the flipside, when “deficiencies” are identified in a nomination process, the CRC reports back to the institutions with its concerns “in the hopes that this will improve in the future,” Ms. Boutin said. She said all these developments have encouraged institutions to work on effective equity hiring practices and have created a “dialogue” around the issue of equitable hiring. Both Dr. Dodd and Dr. Postovit say they are cautiously optimistic about the various changes to the CRC program, but hope to see more targeted initiatives. “In the last round there were supposed to be Canada Excellence Research Chairs in areas that were more likely to capture women candidates, and despite that initiative, we still only seem to have one woman out of 22 who hold what we call ‘super chairs.’ We have to be very, very aware of continuing to exclude women from these prestigious and important positions,” said Dr. Dodd. 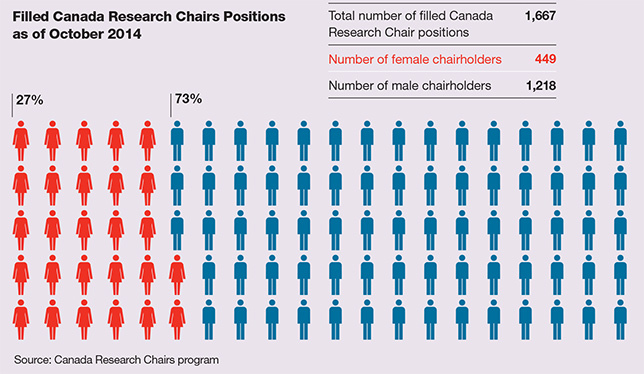 As of October 2014, women occupy 26.8 percent of all filled Canada Research Chairs (449 women out of 1,667 chairs). More women hold Tier 2 chairs for emerging scholars (315 out of 856 positions) than Tier 1 chairs for established scholars (134 of 811 positions). Excellent initiative. Now if only we can get rid of the 27 red dresses representing women in the infographic! What is with this dumbing down of data? Do we really need to visualize 100 stick figures to get this percentage breakdown? 1) Why indeed, in a University publication, is a simplistic graphic needed to convey a percentage? Surely most of us would agree that it isn’t needed! 2) But given that a graphic was used, does CAM have a particular objection to using dresses and trousers, considering that these are common public symbols to distinguish between men and women? Does CAM consider them sexist in some way? If so, what would be an acceptable alternative? I can try to explain this from an editorial-design point of view. We created the graphic illustration for the print magazine, where we need to fill a block of space on the page with an image. We didn’t have any appropriate photos to go with this story, so we created this to illustrate one of the points of the article. When we posted the story on the website, should have used this image, or none at all? Since we had it, we used it. Perhaps next time we won’t. Thanks for your comments. I don’t have a problem with the image …. the fact that it was used but wasn’t “needed”, doesn’t bother me at all (and the editor has explained clearly why it was used). But I sensed a sub-text that the red dresses offended CAM as sexist. As I read the comment again now, I may have totally mis-understood that ….. His/her comment clearly emphasizes the dumbing down, not the red dresses! For Tier 2 Canada Research Chairs, the real issue is the discrimination against researchers who obtained their PhD more than 10 years ago. This restriction stops many women from applying. The original study on all this (which I haven’t read) may well have shown a correlation (but how strong was the correlation?) between the types of adjectives used in letters of reference and the gender of the applicant. Although, according to the UA article, the percentage of female CRC Chairs is only 27% of the total, is there any way of knowing the extent to which the “unconscious bias” in reference letters influences hiring committees in their decisions? A casual looking over past letters of reference that I’ve written for students (although I haven’t been asked to support someone for a CRC Chair) suggests that I’ve used some of the frowned upon adjectives for both male and female applicants. Furthermore, when I’ve been on committees evaluating students for graduate admission, scholarships and the like, I can’t imagine that my decision one way or the other would have been negatively influenced by the referee using first names rather than Mr/Ms/Dr, or negatively influenced by reading cheerful things concerning the personality of the applicant. And frankly, when I’ve encountered superlative praise in a reference letter, I’m just as likely to regard it with some suspicion until I can see some objective evidence to support it in the application. In brief: what evidence is there that our choices in language contribute to whatever discrimination women may face in securing prestigious posts? This is good news but it doesn’t address the underlying problem, which is that reference letters (really letters of recommendation) are relied upon very early in the process. As I understand it good HR practice for equal opportunities hiring suggests that reference letters should ONLY be requested at the end of the process for the candidates you choose to appoint and at that point they should be used only to confirm what the hiring committee has already learned from application, interview and other direct evidence. This is a problem not only for CRCs but for academic hiring as a whole, where letters of recommendation are often submitted early in the process and where the name of the person referring is often taking into account as some kind of evidence of the quality of the candidate.